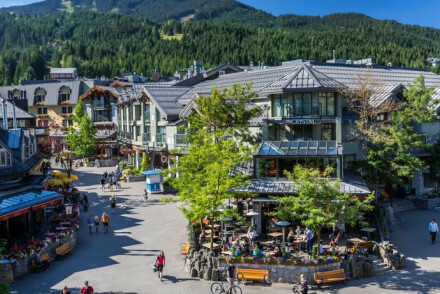 With its pretty alpine village - which wouldn’t look out of place on a Christmas card - you might think Whistler has been a ski resort for ages, but it’s really very new, the first ski season was held here in 1966. And it’s now the largest ski area in North America, nestled into the fold of the Whistler and Blackcomb Mountains. As with many spectacular ski resorts, the best places to stay in Whistler are either those with the best views, or the best access to the slopes. Whistler is also extremely popular in summer. 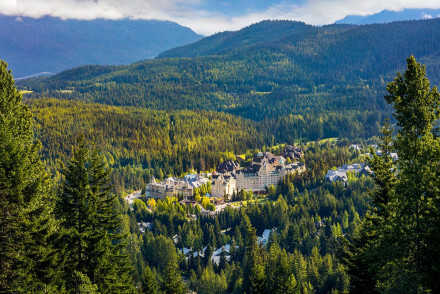 It’s packaged as an adventure playground, with great hiking, climbing, mountain biking etc., and all the best hotels in Whistler have great summer facilities as well as ski storage. The spectacular snowsports scene. Whistler Blackcomb has 37 lifts servicing over 200 runs across the two mountains, with a vertical drop of around 1,500 metres (5000 feet). There’s a huge range of terrain, from great beginner runs, to chutes and trees, powdery bowls and groomed cruising runs. There are also four terrain parks and miles of cross country trails. Hitch a ride in both summer and winter on the glass-bottomed Peak 2 Peak Gondola whisking visitors 4.4km along the world's longest continuous lift system with jaw-dropping views above and below in abundance. Visitors can even enjoy a mountain-top feast at the Roundhouse lodge. Experience first-hand the thrill of rushing downhill on the fastest icetrack in the world at the Whistler Sliding Centre. Visitors are able to relive their Cool Runnings dreams on the bobsleigh or experience hurtling down the track head first on the Skeleton Bob. Take a break from outdoor adventuring and visit the Squamish Lil'wat Cultural Centre featuring indigenous artifacts and performances designed to share the fascinating local culture with the world. Planning to visit in either winter or summer? To ensure a room in one of the best places to stay in Whistler, you'll need to book well ahead as the area is popular across both seasons. The Four Seasons Resort Whistler is an elegant resort in Whistler’s Upper Village. This is a large hotel with a range of room options, and some have kitchens as well as balconies overlooking the mountains and floating fireplaces. There’s also a chic restaurant. Nita Lake Lodge is a luxurious boutique hotel right on the shores of Lake Nita. The 77 rooms are understated and elegant and many of them have spectacular views. There’s a restaurant specialising in locally sourced produce plus an outdoor heated pool. The Crystal Lodge Hotel has a range of accommodation options, from traditional rooms to loft suites, and they’re all spacious and tastefully decorated. The hotel also has great views and a great bar. Rooms start from around £70 per night. Sleek and modern, the Adara Hotel has 41 rooms decorated with floating fireplaces and original art works, plus great ski storage facilities and views. And you’re close to some of Whistler’s best restaurants and bars. Fly to Vancouver International Airport located 134km (83 miles) from Whistler. Transfers to Whistler from the airport are available. Take a bus from Vancouver to Whistler providing exceptional city and mountain views alike. Best time to visit - for those looking to go camping or explore the great outdoors, June-August offers warmer temperatures, whilst the Glacier is also open for snowsports. Skiiers should aim for December-February, although March also tends to offer good quality snow, but with warmer temperatures. 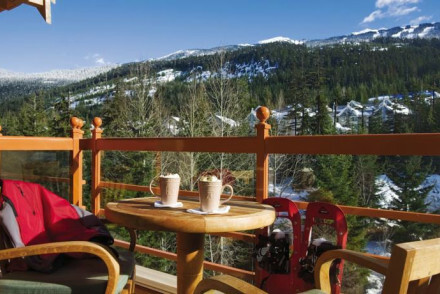 Still not sure which is the best place to stay in Whistler for you? A 'has it all' hotel in the ultimate adventure playground. Whether it's a traditional room or a loft suite required you'll find the rooms spacious and tastefully designed. Fill your days in the outdoors be it skiing or bungee jumping before unwinding over a glass or two in the hotel's wine bar. Skiing - When the snow falls the hills come alive with skiing, ice skating, tubing, dog sledging and snow shoeing. 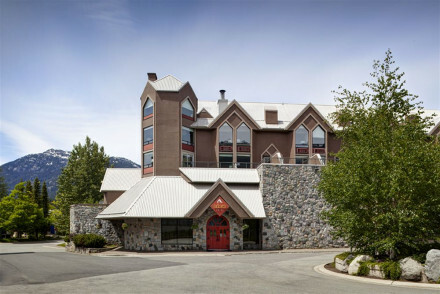 A stylish hotel located in the beautiful mountain town of Whistler. The sleek modern rooms feature floating fireplaces, comfy beds, and original art pieces. Ski storage, rental and repair make this the ideal ski hotel, while proximity to Whistlers top restaurants and clubs takes care of après ski! Fishing - The rivers of the region are rich with fish, just ask at the front desk about organising a trip! Swimming Pool - Outdoor seasonal pool. A luxury boutique hotel and spa on the shores of Lake Nita. Understated elegant rooms feature neutral tones and command breathtaking views of the surrounding countryside. The yummy restaurant uses locally sourced forage and farm produce. A peaceful retreat from fast pace life. Fishing - The hotel provides rods free of charge for fishing on the lake. Great walks - Lovely walks around the scenic Nita Lake. Swimming Pool - Outdoor heated pool. 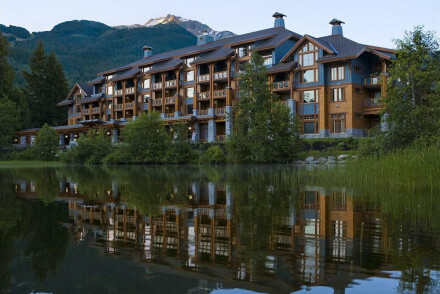 A high end Four Seasons resort in Whistler's Upper Village. Rooms are modern, elegant and spacious and come with a range of amenities from kitchens, to floating fireplaces and balconies overlooking the mountain. The chic on site restaurant is a huge reward after a day on the slopes. Swimming Pool - Outdoor year round pool. A grand and striking Chateau perfectly placed at the base of Whistler Blackcomb mountain's Gondola. The rooms are exactly what you would imagine from a chic mountain hotel, wood furnishing and spectacular views of the mountains. The Chateau has every amenity you could think of, and fantastic food. Active Holiday - Ski to door access in winter, and direct links to bike and hike trails in summer- an active guests dream! Tennis - After a long lunch and a morning in the spa, invigoriate yourself on the courts!